CargoForwarder Global previously reported that CHEP Aerospace Solutions was to be sold by Brambles to the Swedish equity house, EQT Infrastructure. All had agreed on the terms and conditions and now the deal has finally received rubber stamping. The Zurich-based aircraft ULD, pallet and galley management company has been expanding its list of customers steadily during the past few years. No wonder that the Swedish equity house had cast its eye on CHEP. 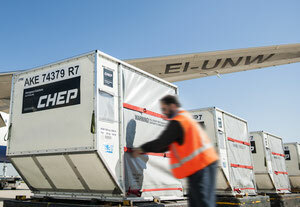 Brambles, the Australian global supply-chain logistics provider acquired various then existing ULD companies and thus created CHEP Aerospace Solutions in 2011. CHEP’s present president, Dr. Ludwig Bertsch has been at the helm of the company since then and has followed a strategy of expansion and new customer portfolios and which now manages the world’s largest independent fleet of aircraft unit load devices (ULDs). Brambles has invested much into CHEP Aerospace and it is expected that EQT will continue along the same road. EQT Infrastructure is part of the EQT Equity Group and is said to have an operating capital in the region of EUR 30 billion. EQT has also announced that there will be no change within the present management structure and that the day-to-day business will continue to be run by the current management team under the leadership of Ludwig Bertsch. Peter Nilsson, will act as Chairman of the Board and who is also Board Chairman of various EQT companies. Robert A. Milton who was formerly Chairman and CEO of Air Canada. Vagna Sorensen who is Vice Chairman of Nordic Aviation Capital, the largest leasing company of turboprop aircraft. He is also a board member of Air Canada and was previously CEO at Austrian Airlines. Ulrich Koellensperger - who is Director of EQT Partners and an Investment Advisor to CHEP’s new owners, EQT Infrastructure. Board members with varied airline and aviation experience, which will surely be of benefit to CHEP Aerospace in the future. More and more of the world’s airlines are waking up to the fact that a dedicated outsourcing of their aircraft underfloor and galley equipment will be financially more beneficial for them in the future. This can only mean that EQT will support CHEP with the funds necessary to promote the above within the airline industry and allow them (CHEP) to strengthen and expand their current ULD management portfolio.